ii. Those who dismiss it. 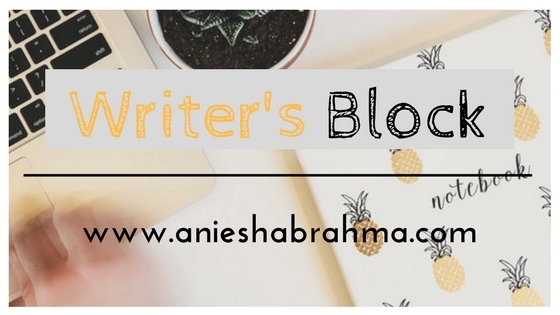 For my part, I have both believed and not believed in writer’s block for a number of reasons. There’s a rather funny definition of writer’s block wherein one believes it occurs when your imaginary friends refuse to talk to you. Because let’s face it all our ideas and stories seem to come from this mysterious Source. Maybe this Source is the imaginary friends that we joke about. You could be sitting at your work desk and be hit by an idea suddenly. Or you could be in a crowded metro trying your best to keep yourself from falling on the next person when suddenly a brand new idea dawns on you. It is unbearable if you are unable to get to your phone and type out a hasty note. Because the biggest lie we tell ourselves is the fact that we don’t need to write something down, for we will remember it. Believe me – we will not. I have been a victim of writer’s block quite a number of times. There were days that I haven’t felt inspired to get out of the safe comforts of my bed to sit at the laptop and hammer out a new story. There were days when I couldn’t even bring myself to name the characters who would be appearing in my stories. Because when you fall into a writing slump, it’s rather difficult to get out of it. For a question that nags you at the back of your mind is – but who is going to read my story anyway? Whose life depends on the fiction that I come up with? The answer to which is: YOU. You chose to write. You chose writing. You owe it to yourself to tell the world the stories that are raging inside of your head. So even when you don’t feel like writing a word, you are going to force yourself to get up and write one word after another until you form a sentence. When writers start out their careers, when they are writing for pleasure, it becomes all too easy to say ‘oh I can’t write without inspiration’ or ‘Oh, I need such and such circumstances to happen in order to write.’ Let me tell you a secret. The Universe isn’t going to align itself perfectly for you to write the story that will change the lives of thousands of people who read it. You are going to learn how to write under any circumstances. You’re going to teach yourself to adapt. Why, you ask? Because you are a writer, and primarily, writing is your job! For me, I have had both commissioned and non-commissioned projects and had to work with deadlines. Imagine if I had just woken up one day and said, “I am not inspired enough to write.” And I would have never seen a part of my earning! It is good to romanticise writing by saying you have to do this and that in order to write. But at the end of the day, for me personally, writing is a job and in order to make sure you get your job done, what you need is discipline. Therefore the first thing you need to do is set aside a time everyday (doesn’t matter whether it’s the weekend or weekdays or a National holiday), you’re going to make sure you sit at your desk and write. Even if it is ten words! Believe me, in seven days, it will become second nature to you. This is one of the reasons why I love NaNoWriMo so much. If you wrote 1,667 words every day for a month, you’d have 50,000 words at the end of it. And which is fine because you can actually have a novel that just needs a lot of editing and sprucing. Let’s face it, you can edit this first draft. But you cannot edit a blank word document. So in the end, I firmly stand by the belief that there’s no such thing as writer’s block. It’s just you not wanting to break out of the safe comforts of not having to write. Or simply not making the time to write, and so if the novel that you were supposed to complete by March hasn’t been written yet – it’s probably your fault. Once you realize that, just make a writing schedule and stick to it. Or list out the things you need to write each day. This has been working out pretty well for me so far. Let’s see how soon you are able to see When Our Worlds Meet Again in the market. I found so many informative stuffs in this blog. This was very clear and easy to understand.Now i am clear about this topic.Refer the custom essay writing service for more detailed information.Thank you so much for sharing this information. They need to know relating to the experience of other individuals top essay help and they are examining for recently honest and set up data.